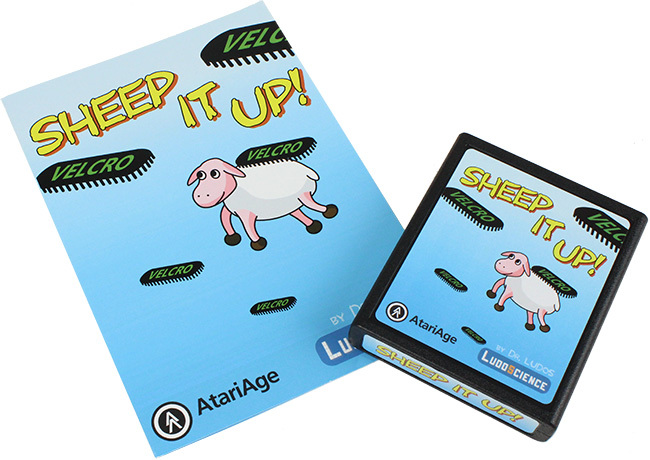 Today AtariAge released my first game for the Atari 2600: Sheep It Up! It's an arcade game where a sheep has to climb up by hanging himself to flying velcro straps. The concept is simple, but the game rapidly gets quite challenging: how high can you climb without falling down? The game is available is 3 versions, to cater for the various Atari 2600 console versions: NTSC (60hz), PAL (50Hz) or SECAM (50hz with a 8-colors only palette). If you are looking for a challenge, the current record is 28 points! Fun stuff. Are you planning on doing a postmortem write up like you did with the gameboy version? I'm glad you enjoy the game! But maybe I'll try to write something too, even if I'm no expert on the console compared to the two resources I mentioned. I guess I'm interested in what tools you used. Did you use Batari Basic or is it pure 6502 assembly language? Any trouble keeping it under 4K? Stuff like that. I have read Racing the Beam though and would also recomend it to anyone wanting to know(in a accessible way) what went into making the games, as well as being a nice history on Atari durring those years. Anyways, good luck with the game. The game is 100% made in batariBasic, and use the standard kernel (so no multisprite through sprite flickering, but that wasn't required for this game). The difficulties I faced was to draw "2 color" sprites (each line of each sprite can only have one color), so I actually overlapped the ball with a player sprite to draw the sheep in two different color. It took some time to have it look right for all the animation frames. That's also why the coulds are "light grey" instead of "white" color: because they share the "BALL" color, that is used to draw the face details of the sheep. It proved even more tricky when making the SECAM version of the game, because this version of the console features only 8 different colors (from around 100 in NTSC and PAL version of the console). So, in the SECAM version, the sheep is blue . Regarding space, at the end it was indeed difficult to stay below 4k. I had to refactor my code several times to make it smaller. For example, the "title screen" and "game over" screen had to use the same "oscillation" animation frames, etc. All in all, it was a wonderful experience and it really motivates me to make other Atari 2600 games, as the console is very interesting to code for (and quite easy to learn thanks to batariBasic). 28 just seems impossible at this point. The best score I managed to get was 6...usually it's 3 or 4. I like the screen shake effect you did when the sheep goes thud though. When I was playing around with Batari Basic I had to rewrite quite a bit of it in assembly to even attempt to get it under 4K. The compiler just isn't too efficient in those regards. In the end though, I wouldn't have been able to get in everything I wanted to, and since I was just making it for fun I stopped trying and let it be an 8K game. Some of the tricks that they used to use back in the day, though, were crazy/brilliant. Like designing sprites so their data would also be executable program code, just to save a few extra bytes. The secret to a good highscore is to jump at the right moment (moving left/right is only helpful to correct a slightly missed jump). Yes, I've read some of the crazy trick they used back in the day to fit the game in the tiny cart. I think that for example the shield pattern in Yar's Revenge is actually made from actual code inside the game and not a random number generator to save space. Is Mortal Kombat the black sheep of the fighting game community?